Wine cover, this is genius! Necessity is the mother of invention! I sure didn't want to taint my wine while I was getting ready last night. I came up with a great idea, a wine cover! 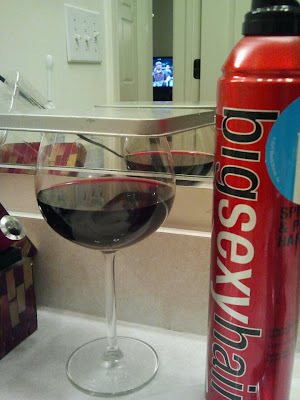 The whole bathroom smelled like hairspray, but my wine was just perfect! Cheers! Peanut chicken served with brown rice is full of flavor and added nutritional value from brown rice! Makes 3-4 servings. 1. Saute vegetables in oil over low heat. Meanwhile, begin rice. 2. Whisk all peanut suace ingredients together. Mixture will not mix together right at first, but will after a minute or two with a whisk. 3. Toast coconut in oven/ toaster oven, if desired. 4. Cut chicken into strips, begin sauteing over low-medium heat until cooked through.